Stanley Chumfwa on the move against Libya’s Elbaruni Mohamed. Of course, there was a notice of the absence of Zambia’s top player Amon Simutowe who is currently undertaking advanced studies at Oxford in England. Imagine what could have been if the “Zambezi Shark” were present. Nevertheless, Zambia’s Chumfwa (7½/10) and FM Daniel Jere (6½/10) rose to the occasion and helped the team take home the gold. Gillan Bwalya scored a respectable 4/8 in his Olympiad debut; Kelvin Chumfwa had 2/8 and Andrew Kayonde was on 5/8. Zambian women had some high moments with a couple of impressive wins. 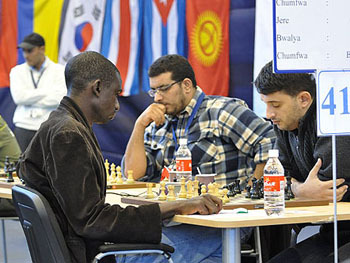 Thanks you for the olympic coverage once again brother Shabazz!and i see the chessbase site have a few photos persons of African descent , traditionally i didnt see this on their sites but apparently UM just wakin up to the reality that we know a thing or two about the game clearly by the games presented here, well done Zambia and congratulations to you all! Peace. Strong team spirit and great determination to create upsets: those were our two main strenths at the just ended Olympiad. Despite our horrible loss to Germany in the first round we managed to reorganise and pick ourselves up. From my observation,most African teams seemed to lack this vital component called “team spirit”. And funny thing is most lost games that they were clearly supposed to convent to a win » this was something common among almost all African nations (including Zambia).Egypt may have been the only one exempt from such mistakes. We have some work to do if we have to increase the number of African teams getting medals at the Olympiads. Thanks for the coverage and the wonderfull title to this article! There has been some discussion about the absence of Zambia’s leading player GM Amon Simutowe. Apparently there was a rumour spreading around Khanty-Mansiysk (and later on chess discussion sites) that he was asking for a sum of US$30,000 to play for the Zambian side. These rumours have proven to be false. After Simutowe learned of this rumour, he wrote several statements to give his side. The rumours started in Khanty-Mansiysk and spread onto the Internet after the tournament was over. Here was the entry on the Kenyan Chess Blog that started a long thread of discussion. Simutowe read this thread and gave a number of well-written responses. The reality of what has happened is that leading up to the 2010 Olympiad, Simutowe was in negotiations to remedy serious unresolved issues with the Chess Federation of Zambia (CFZ) for several years running. It dealt with the reimbursement of a sum of money that Simutowe (now a graduate student at Oxford) had paid for representing Zambia at his own expense. It is certainly not fair to attack his character in the aftermatch of Zambia’s success. The hateful rhetoric that Zambia did well because he was not on the team, is both insensitive and foolish. That Zambia got 47th place is only a testament to Simutowe’s impact. FIDE Vice President and recently-elected CFZ President Lewis Ncube has stated that Zambia will produce another GM. Zambia certainly has a cadre of talent. Let us celebrate Zambia’s success and hope that it will serve as a beacon of hope for other African teams. Congratulations Zambia on your performance and for representing us well. We Zambians are very proud of you. Seeing you score ahead of countries like Germany and Norway has really motivated me personally as a chess player. Wow! Congratulations Zambia! You’ve, made us proud. Please keep working hard for more future success. You fought gallantly! You will forever be remembered for this! I am wondering, are the final positions of Egypt and Zambia the best finish Africa has ever had at the olympiad? You can always go to olimpbase.org and check all the records.